Balti Veski AS was founded by the descendants of the entrepreneurial Puhk family during the time of the first Republic of Estonia. The owner of a big flour mill, warehouses and the Estonia-wide retail chain public limited company Kaubamaja J.Puhk & Pojad, father Jaak and his five sons were also involved with metal production and automotive commerce in addition to their grain business. Jaak Puhk is the founder of Viljandi’s match factory, and was also involved with forestry and woodworking enterprises in Riga. In 1934, business man Eduard Puhk, one of five brothers, decided to expand his reach and built a mill in Helsinki. The mill operates today in Finland under the name Helsingin Mylly, although it is now located in Järvenpää, and was the most modern mill in the Nordic countries at the time of its completion. The restoration of Estonian independence allowed the Puhk family to once again start a business in Estonia, in 1993. Today, Balti Veski operates as part of Baltic Mill, the largest grain group in the Baltic States, under the Veski Mati trade mark, offering Estonia’s largest selection of dry goods. 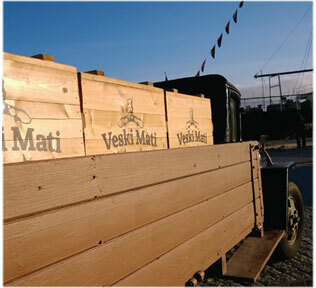 We want Veski Mati to be the symbol of valued and good products for our partners and consumers.